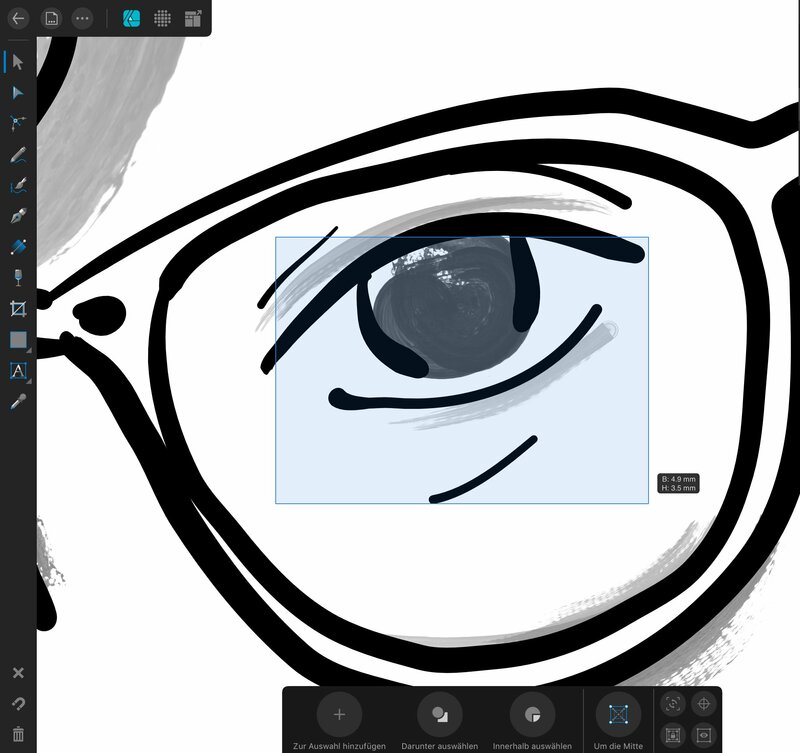 When editing my vector drawing I would like to use the selection tool to select, transform and move the complete eye including outlines and shadows. The tool only allows to draw a rectangle at 1 of 5 attempts (at the faulty attempts always a whole grouping is moved). As soon as I manage to draw a rectangle, not a single layer is marked, although the settings are set in the global settings (see screenshot). The selector "edit all layers" in Layers Studio is also on. I also tried, after selecting the main group, to reach the other objects and groups by double-tapping, but even in this attempt it was not possible for me to combine all the blacks and gray lines of the eye in one selection. I attach my complex AD file to you. How can I quickly select the eye including shades? This problem costs me a lot of time as I have to search for layers in hundreds of layers as a workaround. Instead of making a change in a minute, it takes a lot of effort. The app is really very good, but the Move tool is currently a showstopper when using it. The problem again as video. At the first try I can draw a rectangle, but NO layer is selected (independent of the settings in the lower menu). From the next attempt on, the content will simply be moved. I think you are right. For complex files with many layers it is useful to group and name layer objects that are related. Then you can select the group/groups in the Layers studio. That's exactly how I work, but as soon as I use groups the Move Tool selection doesn't work anymore. But I can't possibly put every ear, every eye, every finger and additionally the coloring for eyes, ears etc. as well as the shades into the small groupings so that I can select them later. I expect to be able to use the Move tool to select individual layers across groups using rectangles and then transform and move them. Here is an impression of what such a drawing looks like for me and why it would be too complicated to group every small element. Normally I separate the outlines, the color and the shades into single groups, so that with customized changes regarding the colors or the strength of the shades only within single main groups must be corrected. If I now have to group every single small element (eye, ear, nose, mouth etc.) in the respective main groups outline, color, shading again, no customer can pay this 'time expenditure'. The description of the functionality of the selection tool also contradicts this way of working. With this tool it should be possible for me to select every element which comes into contact with the selection frame. 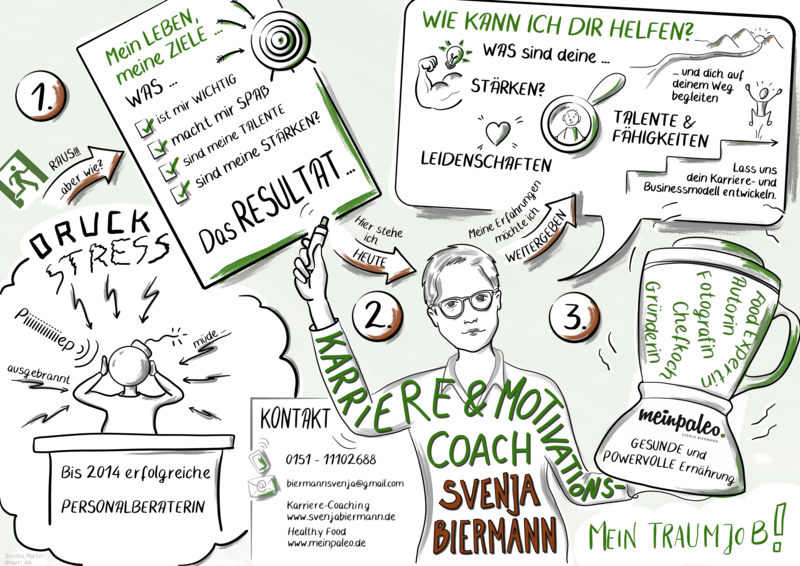 For me and my job this bug is really frustrating at the moment and a showstopper for further use in Visual Facilitation and Graphic Recording. When you try to draw a rectangle around the eye you instead touch a grouped item, selecting that whole group. Instead of moving an eye, you move the whole 'boy' group. The issue here appears to be the way the groupings have been structured. I ungrouped a number of objects and tried selecting the eyes again. You can see the difference here. Thank you so much for taking the time. I see exactly this problem as well. There is no reasonable selection possible across groups. As soon as I now have to break up all the groups that have been created with great effort to make only a tiny adjustment to the eye, it really takes a lot of time. Afterwards I have to try again to restore all these resolved groups e.g. for a video animation of the drawing. This is not effective for my work. In addition I have the problem that the rectangular selection is not recognized again and again and instead one of the groups is marked as Tap and thus constantly shifts arise. I very much hope that the Affinity Team can solve this problem. It must be possible to select individual areas or layers across groups with the selection tool. I have recreated the problem again in a simple file with fewer layers and groups and subgroups and the Move tool works with the rectangle selection as it should. Apparently, the problem really only occurs with more complex layer structures. For me this is clearly a bug . I Agree. With complex layers it’s hard to determine where groups overlap. There are known issues with the select tool (lots of bug reports have been made relating to select/move). The developers are apparently aware of users issues. Hopefully they will improve the selection tool feature. A fix is long overdue but I guess they may be focussing their efforts on Publisher beta development. I hope so much for a solution to the existing problems. I have also read the other tickets with the selection tool problems. It is for me one of the most important tools and should definitely work. If basic problems in the existing apps designer and photo are not fixed the users lose confidence in these apps. As far as grouping by color, the iPad version will hopefully get the "global colors" that the desktop has. If you change a global color for 1 object, all other instances change. AFAIK, the iPad version does not have an equivalent. So, its not a bug, it is a feature not yet implemented. I'm unfamiliar with the term "shading." I assume it is an attribute in some other software. At this point, Designer does not have a find and replace for for multiple objects its own attributes. I don't use the iPad version much, but my experience is that if only the button for what in the English language version is named "select inside," the right most version on the bottom bar, is active, one can hold a finger down and do an extended selection within groups. Thank you very much for your answer. I have compared the procedure with the selection tool again with a simple and the more extensive file. Additionally you can see in the video that I also considered the tip with the finger tap at "Select inside". Unfortunately, the selection tool doesn't work at all with the more complex file (see video). No layer is selected, neither within the group nor across groups. From my point of view this is a bug. The problem is still not solved and so far no answer came from the Affinity Team itself. The fact that I can't select areas with the selection tool to move or transform them afterwards is a huge problem. If I do something wrong, please give me a tip or a workaround. I would like to somehow be able to mark areas with the selection tool. I can't possibly search and mark in hundreds of layers. Even the ungrouping of groups is not efficient for my work. To underline the problem again, today another example where the selection tool does not work. In this example I try to mark the measuring cup to move it afterwards. 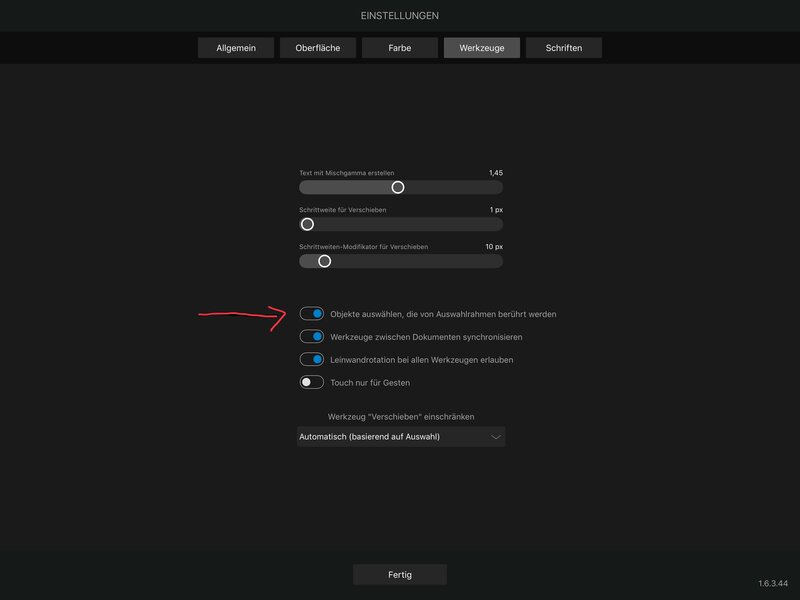 Neither the rectangle selection itself, nor additional options in the lower menu lead to the desired result. As in the first example, I also attach the affinity file to the ticket. Here is a little demonstration how I can work with other apps on the iPad (here Procreate). All elements of a drawing can be selected, moved and transformed afterwards without any problems and independent of layers. This is a basic feature when drawing on the iPad. @Callum Hey Mods, any ideas here. I am having same problem with this file as SandraM. Using select inside, select under and add to selection doesn't select all underlying layers. Very strange and undesirable behaviour. I viewed the vids, and d-loaded the file. Here are my observations. As I understand the matter, default behavior for AD is that the marquee will select individual items, groups, or uppermost parent layers. This is true for both the desktop and the iPad version. If everything is in a group, the whole group is the selection. None of the group members are selected. Myself, I tend to group object if I want to move the or hide them as a mass. The same is true for the iPad version, tho' I have to little experience w. it to know just what is the equivalent of option-click. For this sort of thing on the desktop, I switch to outline view, and click whichever items I want. There does appear to be a short-coming in the iPad version. It seems that as each object is added to the selection, anything that has a bounding box inside those already selected is very hard to add. In my attached image, some of the vectors were hard to get to. Sometimes I could find no place to click and select. Other times, it seemed that the cursor had to be exactly on the vector line. 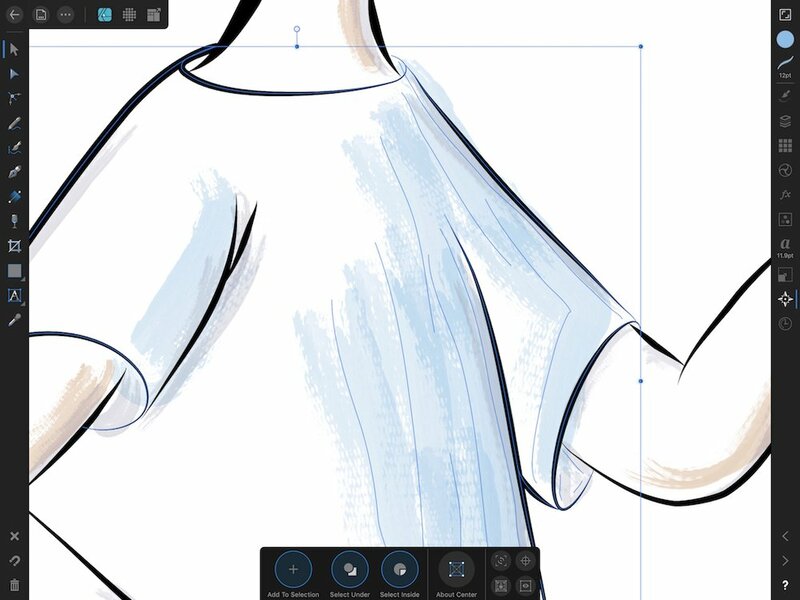 I note that in one example, Procreate (in development since first release mid 2010) shows using a lasso selection. Designer doesn't yet. Would be great if it did. I see in the file items with color are grouped. But those items are across many other groups bounding areas. So unless one drags across the color layer, and then selects other group areas, it is not possible to get to the colored strokes within those layers. Considering that Designer works w. bounding box selections, seems to me to make more sense to place the colored strokes with the other shapes in a group. Thank you again for your time and effort in dealing with my problem. I can confirm your observations, I also often have the problem that I cannot select individual lines and a laborious search begins in the layers. Unfortunately the global color does not exist on the iPad, so I have to make do with the grouping. As a Visual Facilitator, our first job is to translate the ideas and thoughts of our customers simultaneously into picture+text notes. Only at the end are the contents meaningfully structured and brought to life with color and shadow. The colours are within a separate group, so that I can correct them quickly if necessary (see missing global colours), if the customer prefers green instead of blue . So these are very often real-time sketches for which I mainly want to use the program and I love the speed as well as the vectors in AD. I never wanted to go back to pure pixel apps, but for me a selection tool is incredibly important. Crazy way it works with simple nested groups, but unfortunately not with complex drawings and groupings. The lasso selection in Procreate is ingenious . I hope to get a workaround from the AD team for the problems with the selection tool, otherwise I have to go back to Procreate or the various other apps. It would be really frustrating because I find AD optimal for visualization. I hope for an answer . I will look at the desktop version on the Mac and especially the global color. Could it work that I draw the file on the iPad including colors and shadows so that I can add it to the desktop using the global colors ? Or do I need to set this global color before coloring? Update: I just read the AD Workbook and unfortunately I had to find out that I have to color with the "global color" to adjust it later. Too bad, I only have the iPad on hand at the customer's site. As far as I can tell, the global colors need to be defined within the document, and applied to objects as they are made. When I open the "...beer..." document on the desktop, and sample the color from a stroke, and make it global, the colors do not change in the other strokes. I think the global color attribute has to be part of the object from the start. However, because you have placed objects in group stacks arranged by color, it you choose 1, and change the color, you can copy, and "paste style" to the others when they are selected. Thank you very much. In order to avoid the problems with the selection tool, I can no longer work on the iPad with the grouping of colors in separate groups. So the subsequent coloring with global colors of the suggested way "paste style" would not work. Or do I misunderstand that? Paste style will work across groups, but selecting objects could be difficult. If you are changing the way you organize the groups, "paste style" would indeed be harder if items w .the same color (or stoke attributes, etc) are spread over various groups. I looked at global color some more. One can assign a global color to pre-existing objects. For work that has already been done, any color they have will need to be replaced by the global version. I sampled a color in the "...beer..." file, and made it global. But then had to find the other objects w. that color, and "paste style" from the changed item to the rest. All changed at once after that. Thank you, the global colors are a valuable tool on the desktop and I hope that they will soon be integrated into the iPad version. The effort for this workaround regarding the bug in the selection tool is unfortunately too high for me. I still hope that someone from the AD team will take care of the problems with the selection tool. Both DM1 and you have confirmed that you can see the same behaviour as me. My huge enthusiasm for this great app is currently being suppressed by huge frustration and helplessness. It is an essential tool, how long does it take for the AD team to deal with such a problem? Does anyone have any experience? All I can say is that I started using the Affinity products when they were at v1.4. 1.5 and 1.6 came along in about 6 months, which is fairly quick in my experience. 1.7 I think is over a year just now. Seems there is a hump to go over. There have several posts indicating the dev team is re-working some core code, and making sure the suite works seamlessly together. There is a long list of features already slated for implementation. The only thing I can suggest is that you put in a feature request. Maybe ask for a selector that does not recognize group or layer hierarchies, but only base objects. As a personal note, I can understand your frustration. I'm pretty certain this won't help, but here is an old joke. "A man came to the Buddha, and asked, 'What is the quickest way to Nirvana?' The Buddha answered 'Patience'." I have the impression that this ticket is simply ignored. Although DM1 and you confirmed my observations - zero reaction from the AD team. We have a lot to do with software development, but that a ticket not responded to by the vendor for over a week has never happened to me before. The other problems with the Move tool have existed since summer and there is no ETA yet when these problems will be fixed. - Settings- Tools "Select objects that are touched by the selection frame". - Settings in the Layers Studio "Select in all layers". Both are set, there is no need for more additional switches. Simplicity should be the top priority. With these two switches it must be possible to select objects across all groups.